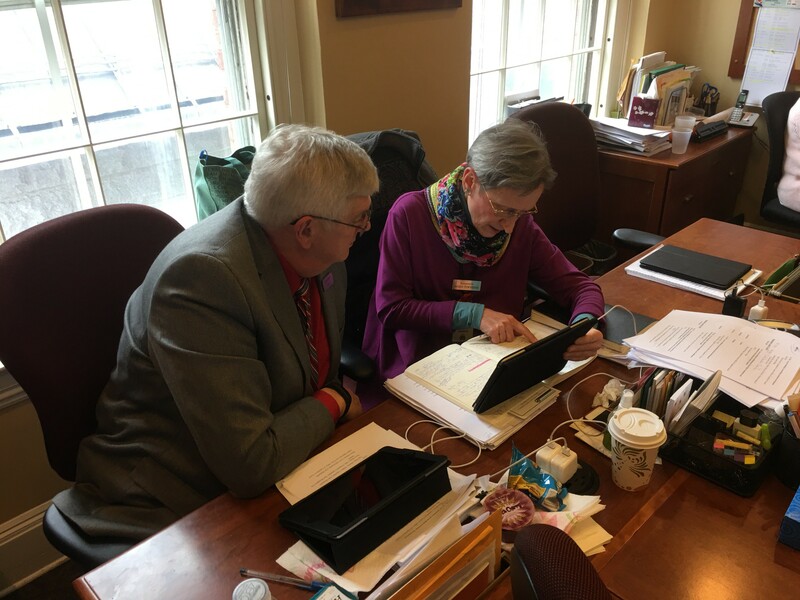 House Government Operations Committee vice chair Ron Hubert (R-Vernon) and chair Maida Townsend (D-South Burlington) going over the wording of S.8. “I can’t believe it,” said Rep. Maida Townsend (D-South Burlington), chair of the Vermont House Government Operations Committee, when her panel reached agreement Friday afternoon on the language of an ethics reform bill. She was only half kidding. The committee’s hours and hours of discussion had at times threatened to put a famous philosophical question to the test: If every step brings you halfway to your goal, do you ever actually arrive? Well, the committee has finally arrived … almost. The bill must be redrafted one more time before the panel can take a formal vote. Barring any last-second problems, that should be a formality. Townsend on Friday left nothing to chance, refusing to comment on the record before the final vote. “Don’t jinx it,” she said, waving me away with a smile on her face. The ethics bill, S.8, would tighten or establish state law on a variety of ethical issues and create an ethics commission with minimal staffing and no enforcement authority. During its lengthy, painstaking process, the House panel made numerous changes to S.8, which had been approved by the Senate unanimously. Most of the changes are minor, but there are a few points that could prove contentious if the full House approves the Gov Ops bill and it then has to be reconciled with the Senate version. Some of the more noteworthy changes: The House committee removed a provision mandating that candidates for statewide office (governor, lieutenant governor, attorney general, auditor, secretary of state and treasurer) disclose their personal income tax returns for the previous year. Also, the Senate had provided funding for the commission through a per-employee assessment on the state’s workforce, to be paid out of a fund for common administrative necessities. In the Senate bill, the assessment would expire after two years; the House Government Operations Committee extended that to three years. The reason for the extension is to allow more time for the commission to establish a track record, so lawmakers can reasonably assess the panel’s work and whether it might need additional resources. One member of the House committee brought a unique perspective to the ethics deliberations. Freshman Rep. John Gannon (D-Wilmington) is an attorney who spent two decades in Washington, D.C., as a financial-industry regulator — 10 years each with the Securities and Exchange Commission and the Financial Industry Regulatory Authority. His duties often involved ethics or conflict of interest cases in the world of high finance. “There’s a lot more money floating around in D.C., especially lobbyist money,” Gannon said. “But there’s still lobbyists around here. Gannon pronounced himself satisfied with S.8 as “a good first step,” although he’d like to see tighter regulation and perhaps a stronger ethics commission in the future. Ooooh. That’ll go over well with colleagues who regularly make the rounds at those events. The House Government Operations Committee is scheduled to hold a formal vote on S.8 Tuesday morning. The bill would then go to the full House.